I have recently been putting complete bicycle up on Ebay, it is a thing I try to do every Spring to clear out some stock here at the shop. I mainly do it in the Spring in hopes to deliver a bike to one of the various swap meets I am already attending, so I don't have to box the bike up. Well to be truthful, I don't have to box the bicycle up, Matthew generally does. It's been a while since my last post and a bunch of things have happened. 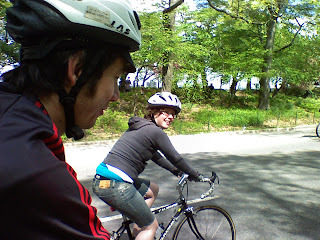 I went to the Trexlertown swap meet, rode the 5 Boro tour in NYC with my wife and friends, and most recently- completed my 400k(257 miles) qualifier ride. 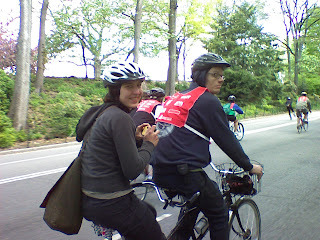 attached are various photos of the past 2 weekends, the 5 boro tour and the 400k ride. 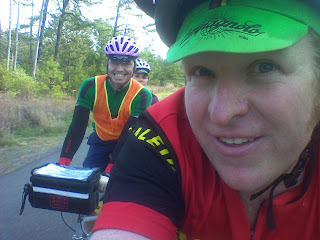 The 400k ride left central New Jersey at 4am and went south to Carney's Point and then further south to Salem. It was a lot of farmland in the beginning, and turned to Pine Barrens for most of the day. One unanticipated happening was the rain, I was without a jacket and even a long sleeve jersey. Our notions of finishing around 9pm-10pm were quickly deluded when there was 60mile stretch of headwind, then hours of rain. We came into the final Controle at 1:30am, having been on our bikes for 21 and a half hours. The bright side is that we had 6 1/2 hours to spare! The trip went well, the weather turned perfect, after rain on Thursday and Friday morning. We left midday Thursday and encountered periods of torrential downpour before arriving at Memory Lane at 11pm. We scouted around and bought one bike that night. Friday morning was looking grim, the field was flooded in spots and that made a lot of mud. 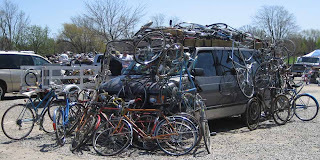 The Memory Lane scene is mostly classic Balloon tire and Middleweight bikes, but we have been going long enough that sellers know what kind of bikes we are looking for and bring them for us. 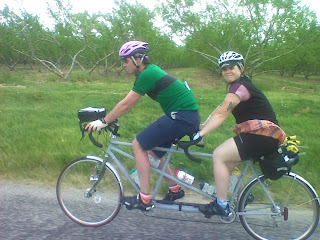 The two days at Memory Lane did not turn up any rare bikes for us, but we did find a bunch of riders to bring back to the shop and a nice Schwinn Town and Country Tandem. The best thing I picked up was probably an NOS TA waterbottle cage, still with the tag. From there, we packed up and drove about an hour and a half north to Ann Arbor Michigan, looking for a motel to take a shower and get a good night's sleep. In Ohio, we sleep in the van usually, or if the weather permits, outside the van. Turns out, it was University of Michigan's graduation weekend and almost all rooms were booked. We found a room, ate, set the alarm, and went to sleep around 9pm. One problem, the alarm went off at 2am, rather than 5am, and we almost didn't realize until we were about to get in the van and leave. I finally went back to sleep around 3:30am. The line of vehicles leading into the swap meet is usually short around 5:30am, but this year it was already around the first bend. That was a promising sign. 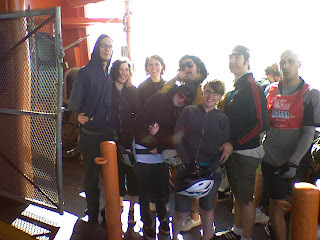 Once we were let in, it was a buying frenzy, 5 bikes bought from one guy, 2 bought on the way back to the van with the first batch. 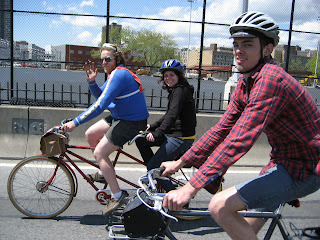 People approaching me to buy their bikes, and even more people trying to buy the bikes we just bought to bring back to Philadelphia. This went on all day. No rare bikes or parts were found, just useful bikes and parts for the shop. I wonder how many people went to the swap meet looking for left side Selecta cranks, basic 1/2" pedal axle BMX platform pedals, or 700c Super Champion 40 hole rims? Probably not many, but we were very happy to find them. I did remember to put on sunblock and drank plenty of water, but the long weekend was getting to us, and the packing seemed to take forever. We were on the road around 6pm or so, and soon realized that we were not going to get that far. So we got a room in Ohio and feel asleep eating Oreos for dinner. The drive back to Philly was nice, the weather was beautiful. I came back with a few "keepers" for myself- all books. I got a set of Schwinn Service Manuals, Collecting and Restoring Antique Bicycles, and some reprints of high wheel and turn of the century bicycle catalogs. Overall, a nice trip, but it left me wishing I found something cool. 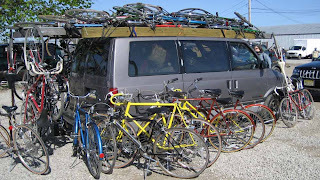 Pictures are of the bikes we bought there, we arrived with an empty van!